Red colored earth, vegetation everywhere and endless swamps are the elements that best describe the Pantanal. This vast land is flooded half of the year, and contains an extraordinary biodiversity. Almost African savanna like in appearance, it is an explosion of colors and sounds of wildlife; an animal kingdom within your reach, unique in the world. Just after entering the Pantanal via one of its few beaten earth tracks, the Jabiru, the one meter tall and black hooded bird, symbol of the Pantanal, welcomes you and invites you into its domain. This huge bird is one of the amazing creatures living in this area almost untouched by the human activity. Eagles, falcons, kingfishers and cormorants appear from all directions and the magnificent blue, red and yellow araras ("large parrots") are to be seen by surprise at daybreak or as the sun sets. Bridges span the rivers regularly, and from there you can easily spot alligators, staying very still in the sun on the water’s surface. Later on, you can discover by horse or by foot, groups of coatis or entire families of capybaras, the largest of rodents inhabiting the Pantanal (there are 600.000 of them!). Standing on a higher point in a grove of trees a few meters above the gigantic swamp of the Pantanal, our "Pantanero" guide will share the secrets of this hostile and fascinating environment: medicinal plants, fig trees "trees that swallow up other trees", and teach you how to adapt to this special environment. 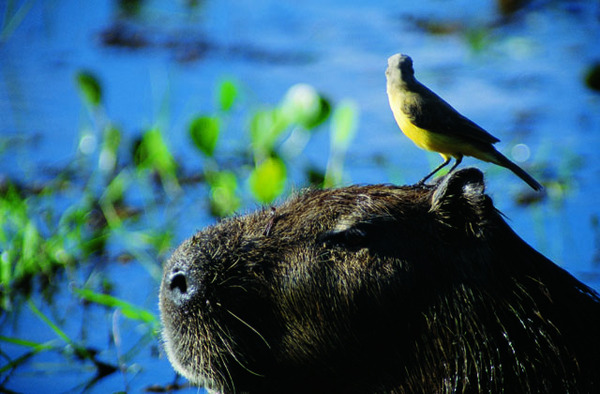 The Pantanal is like a natural symphony which can be enjoyed by whoever do not mind the lack of comfort there. Important: For a stay in the Pantanal we recommend avoiding the rainy season from early December to the end of January, because of high levels of water (which make some excursions unfeasible) and the high number of mosquitoes which can cause great discomfort.